Not everyone can afford to travel. 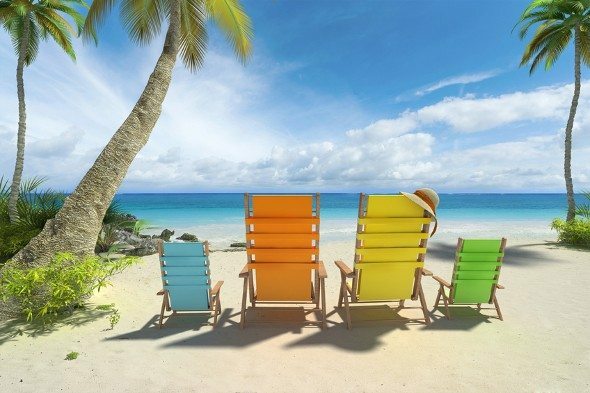 Depending on where you want to go, traveling to a distant land or a tropical beach might require you to cut back on how much you are putting toward savings or even dip into savings marked for another financial goal (as always, it’s best to save up for the vacation ahead of time). And when you have kids, planning a vacation that doesn’t leave you feeling financially strapped can be incredibly difficult. That’s why we took the time to find the most affordable U.S. travel destinations. Looking to collect travel rewards? Find out the best rewards credit card for you. Déjà vu. Seven of the most affordable travel destinations for families of four from our 2015 study made the top 10 list again this year. Florida reigns. For the second year in a row, the Sunshine State has the highest number of cities in our top 10 list of cheap travel locations. Peas in a pod. Nine of the top 10 cities for families are also top cities for singles. Orlando is the most affordable U.S. travel destination for singles and families of four. A couple and their two kids can expect to pay an average of about $2,439 for a three-day and three-night weekend getaway. In contrast, a single traveler would pay just $837, on average, for a plane ticket, rental car, two nights in a hotel room and two meals per day. While you’ll likely be lured to stop by Disney World’s Magic Kingdom and Universal Studios, it might be fun to check out some of the other attractions that the city has to offer. The Leu Gardens is an inexpensive place to visit. So is the Orlando Museum of Art, which costs $10 for adults and $5 for college students and kids between the ages of four and 17. Reno is another budget-friendly travel spot for both families and singles. On average, two hotel rooms for a family of four would cost only $176 per night and round-trip airfare would cost about $1,360 ($340 per person). Much like Las Vegas, Reno is known for its casinos. It’s also home to the National Automobile Museum and festivals like the Great Reno Balloon Race, which takes place for three days each year in September. A weekend trip to Las Vegas can be quite affordable, at least until you get carried away at the slot machines. The average family of four can expect to spend an average of around $2,496 on restaurant meals, flights, a rental car and a couple of hotel rooms. There are plenty of fun things for adults and kids to do in Vegas. There’s Adventuredome, an indoor theme park, and go-kart racing at the Las Vegas Mini Gran Prix. Both attractions are relatively reasonably priced, so a visit to either one probably won’t break the bank (as long as you budget accordingly). Tampa could be the perfect place to take your family over the summer. You’ll be in close proximity to the Busch Gardens theme park and a number of beaches. And when you’re ready for a bite to eat, you’ll find that downtown Tampa has a diverse selection of restaurants. The average meal at a mid-range restaurant (that’s not too pricey, but not too cheap) would cost $20 per person. For the second year in a row, Fort Lauderdale ranks as the fifth most affordable weekend vacation spot for a family of four. Based on SmartAsset’s analysis, the average cost of a trip to the city has only increased by 1.8% since we conducted our first study on cheap travel destinations in 2015. Compared to our data from last year, 2016 flights are 16% less expensive, on average. Low hotel rates are part of what makes Albuquerque an inexpensive place for families (and singles) to visit. A single overnight stay will cost a family of four $91 per room and $182 for a couple of rooms. When you’re ready to venture outside the hotel, you and your kids can check out the BioPark Zoo or the BioPark Botanic Garden. If you’re trying to take a break from the sunshine, you can hit up the BioPark Aquarium. General admission is $12.50 for adults and $4 for children between the ages of three and 12. If you’re making a list of cities to visit during a long weekend, you might want to consider adding Tucson, Arizona to it. The average cost of a meal in the city is $19 per person. And at $99 per night, average hotel rates are much cheaper than they are in other places. 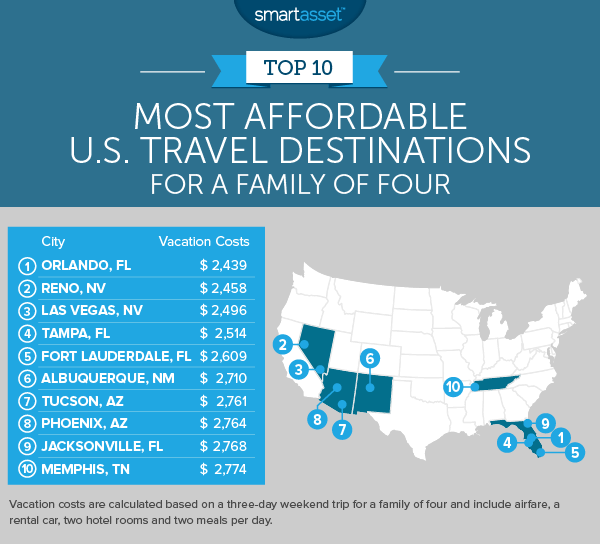 Our analysis shows that Arizona’s capital city is a relatively cheap place for families to visit. The average baseline cost of a three-day trip to Phoenix is about $2,764. If you fall in love with the warm weather and the desert air, moving there might not be such a bad idea, particularly if you’re planning on renting instead of buying a house. According to myapartmentmap.com, average fair market rents for two-bedroom and three-bedroom apartments are $1,189 and $1,560, respectively (as of June 2016). By car, Jacksonville is located about 141 miles away from Orlando, Florida. Based on the data we collected, we found that it can also be a great travel destination for families. Average car rental rates ($29 per day) and hotel rates ($99 per night) are fairly low. Round-trip airfare costs $372 per person, on average. But you might be able to find cheaper plane tickets if you use a tool that shows you the best times to book flights. Known as the Home of the Blues and the Birthplace of Rock ‘n Roll, Memphis ranks as the 10th best vacation spot for families traveling on a budget. A three-day and three-night trip to the city has an average baseline cost of $2,774. As you think about sites and tourist attractions to check out, don’t forget to drive by Graceland, Elvis Presley’s former home. Nine of the 10 cities that ranked as the most affordable travel destinations for families of four also ranked as cheap places for singles to visit: Orlando, Reno, Tampa, Las Vegas, Jacksonville, Albuquerque, Tucson, Fort Lauderdale and Phoenix. For 2016, Sacramento, California ranks as the 10th best city for budget-conscious single travelers. Traveling solo? Sacramento ranks as the tenth cheapest spot to visit. The basics for a three-day weekend rendezvous in Sacramento would cost you just $960, on average. If you happen to be there in July, you might be able to catch the California State Fair. Otherwise, you can visit some museums, cross over the iconic Tower Bridge or relax in McKinley Park. SmartAsset looked at the average cost of a three-day and three-night trip for two different groups: families of four and single travelers. 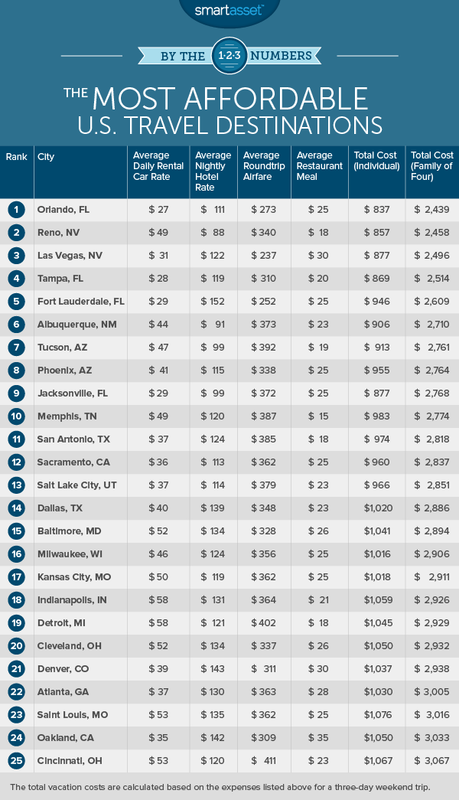 We included basic vacation costs for the 48 largest U.S. cities. For each city, we calculated the cost of taking a vacation by combining the following factors: average nightly hotel room rates, average daily car rental rates, average round-trip flight costs and the average cost of a restaurant meal. The data on hotel room rates comes from hotels.com. Car rental rate data comes from cheapcarrental.net. Airfare data comes from the Bureau of Transportation Statistics and restaurant meal prices come from numbeo.com. In order to determine which travel destinations were most affordable, we made several assumptions. For this study we assumed that a single traveler would need one rental car, one plane ticket and one hotel room. We also assumed that a family of four would need one rental car, four plane tickets and two hotel rooms. Finally, we assumed that both families and singles would only have two restaurant meals per day. Average meal prices for each city are based on the cost of dining at moderately-priced restaurants.